This post examines the potential for market distortions caused by the price support programs currently proposed in the House and Senate 2013 Farm Bills. It is common for discussion of market distortion to focus on the level of price supports, but the degree of distortion reflects the interaction of all of a program’s parameters. One of the hot topics in business today is the role of product design. In many respects, this post is a discussion of policy design and the potential consequences of design decisions. The post builds on two recent posts by Nick Paulson, “Expected Price Support Payments for Corn and Soybeans” on June 6, 2013, available here, and “Comparison of Approaches to Price Support for the 2013 Farm Bill” on May 23, 2013, available here. Both the House and Senate Farm Bills propose price deficiency payment programs — programs that make a payment when the market price is less than a target price. Both bills replace the historical term, target price, with a new term, reference price. Moreover, the House renames the counter-cyclical target price program the Price Loss Coverage program. The Senate renames it the Adverse Market Payment program. These changes likely reflect a decision that the existing names have either acquired a negative connotation or send an undesired message. Part of good product design is the appropriate naming of the product. In a deficiency payment program, the setting of the support prices is a critical policy design feature. In general, the House and Senate take different philosophical approaches in designing the level of the reference prices. The Senate largely takes a market-oriented approach. Excluding peanuts and rice, the reference price is 55% of an Olympic average of the 5 most recent crop marketing year prices (an Olympic average removes the low and high values when calculating the average). In contrast, the House takes the usual, historical approach of setting the reference price at a value that is fixed for the life of the farm bill. Fixed prices are largely determined by budget constraints and the political desire to assist some crops more than others. Thus, fixed prices have the potential to create outcomes that differ from the market. One conclusion from years of research by academics into price forecasting accuracy is that a reasonable, often the best, forecast of future price is the current market price. Moreover, market price is a key determinate of the use of resources. This market-determined use of resources may or may not be seen as acceptable by policy makers. Therefore, a reasonable initial comparison is to compare politically-determined prices with recent market prices. 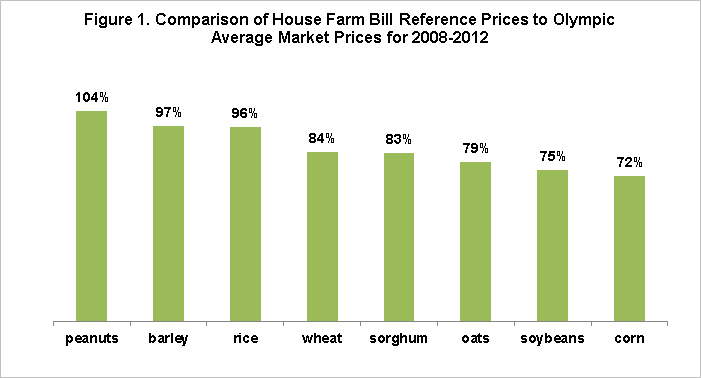 Figures 1 and 2 present the reference prices in the proposed House and Senate Farm Bills as a percent of the Olympic average market price from 2008 through 2012. A value of 100% means the reference price equals the Olympic average market price. The higher the percent the more likely the reference price will offer support above the market level. Thus, the House reference prices favor peanuts, barley, and rice. The price ratio is smallest for corn, then soybeans. While the rationale is not known why these two crops having the lowest ratio, it is possible that this policy design decision reflects the fact corn has been the primary beneficiary of the renewable fuels mandate, with soybeans potentially becoming a beneficiary if and when the biodiesel market expands. 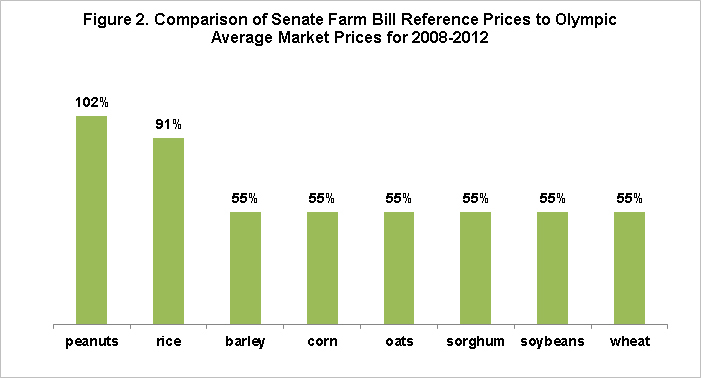 The Senate reference prices favor peanuts and rice. Note that the Senate references prices have the same relationship to market price for all of the program crops except peanuts and rice, for which the Senate replaces its market-oriented formula with a fixed price. The design decision to favor peanuts and rice in both bills is an attempt to address the concerns of southern farms about the loss of direct payments and their assessment that crop insurance does not provide adequate risk protection for them. 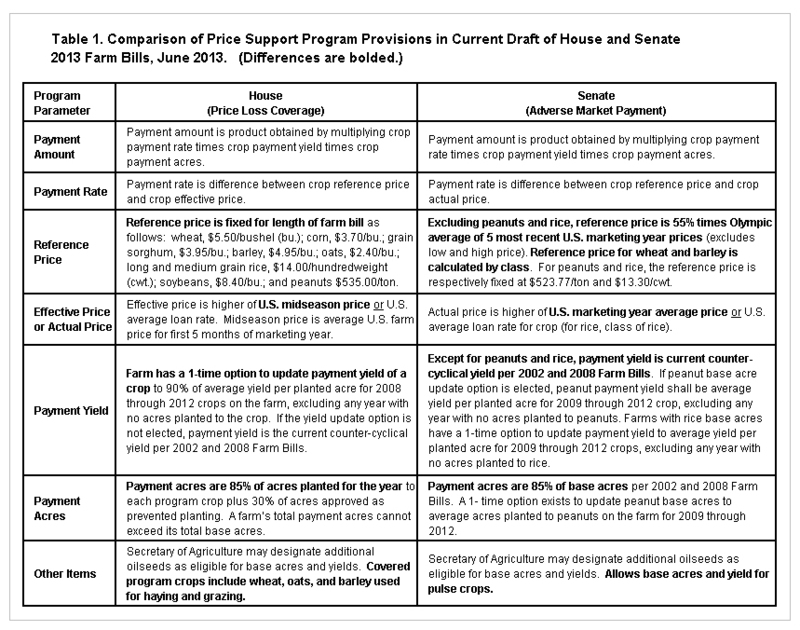 Table 1 summarizes the key design parameters for the House and Senate proposed price support programs. Bolding is used to highlight key difference. Due to limited space, only one other design difference is discussed. Specifically, the House Farm Bill makes payments on 85% of planted acres while the Senate Farm Bill makes payments on 85% of historical program base acres. This difference can have substantial importance. Given that the proposed reference prices are below the current market prices and vary in their relationship to current market prices, it is reasonable to postulate that a general decline in crop prices would result in the proposed price programs favoring the crops with the highest reference price relative to current market price. However, farms would have to be able to shift acres to the favored crops for the program impacts to be realized. By making payments on planted acres, the House facilitates the shifting of acres to crops with relatively higher reference prices. In contrast, by using historical base acres, the Senate bill potentially limits the ability to shift. For example, while the Senate Bill allows updating of peanut base acres, base acres of peanuts in 2010 were only 194,000 acres larger than the average of 1.3 million acres planted to peanuts in 2009 through 2012. For rice, base acres in 2010 are 1.4 million acres larger than the average of 3.0 million acres planted in 2009-2012. The base acre constraint on expanding rice acres is less binding than on peanuts but could still be effective if prices stayed low for a long enough period of time. On the other hand, the use of base acres is less of constraint for most of the other crops. For example, barley, the other crop favored in the House price support program, had 2010 base acres that were 5.2 million larger than the average of 3.2 million planted in 2009-2010. Thus, farms with barley base acres would have substantial leeway to expand barley acre in response to favorable farm policy prices. It is widely recognized that farm program support prices can affect the planting decisions of farms when market prices are less than the support prices. However, for these distortions to occur, farms have to be able to shift acres to the crops favored by the support prices. Both the proposed House and Senate reference prices potentially favor some crops, in particular peanuts and rice. However, market prices have to decline from current levels and stay low. The House proposed price support program facilitates the shifting of acres by making payments on planted acres. The Senate Bill constrains the ability of farms to shift acres by making payments on historical base acres. This constraint especially applies to peanuts but also rice. Base acres provide less of a constraint on distortion for the other crops that are favored in the House Bill. However, a policy design option to substantively limit distortion exists: require all farms to update base acres to the average acres planted in 2009-2012. Conventional thinking is that updating base acres is distorting. This view applies when market prices are below the support prices. However, updating base acres limits distortion when market prices are above the support prices by limiting the ability of farms to shift acres. Such a change would represent a radical change in policy design. This publication is also available at http://aede.osu.edu/publications.